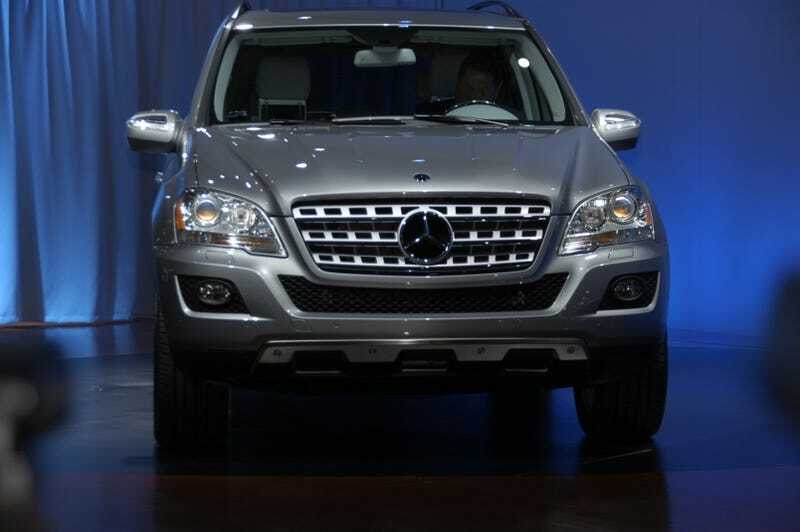 With a combined output of 335 HP, the 2010 Mercedes ML450 Hybrid returns the power of a V8 with the fuel economy of a six-cylinder: 24 MPG Highway, 21 MPG City. *When moving off or at low speed up to the second fixed gear, the ML 450 HYBRID operates in ECVT 1 mode (Electric Continuously Variable Transmission), delivering a very comfortable, smooth ride. *At higher speed from the second fixed ratio, ECVT 2 mode is used. Depending on the optimum operation point, a combined or continuously variable mode is selected. *In the first and third fixed gear both electric motors work synchronously, providing either additional energy for acceleration (boost) or storing the braking and coasting energy (recuperation). *In the second and fourth fixed gear, one electric motor is switched off to improve efficiency. The second electric motor is used for the booster function and recuperation. While at a standstill, the combustion engine is switched off. The air conditioning and power steering functions are fully retained thanks to the electric drive of the air conditioning compressor and the steering servo pump. Manoeuvring, for instance when parking, only uses the electric drive. If the driver presses the accelerator from a standstill, the ML 450 HYBRID moves off solely using electric power. If the accelerator is pressed rapidly, the management system recognises the need for increased acceleration, activates the combustion engine which it backs up with additional torque from the electric motor (booster effect). This noticeably increases the vehicle's agility without having to use the kickdown feature. When cruising, the operation point is shifted toward lower specific fuel consumption figures to increase the efficiency of the V6 engine while in turn also increasing efficiency particularly under partial loads. Recuperation, the conversion of braking energy into electric power and subsequent storage starts immediately the vehicle is in overrun mode or during normal braking manoeuvres. The service brake is also activated during heavy braking. The ML 450 HYBRID can match where necessary the kind of good maximum deceleration you will find on a conventionally powered M-Class with the same superb handling. The start/stop function deactivates the V6 engine as soon as it is not needed, say when rolling up to a red traffic light. As soon as the driver presses the accelerator, the ML moves off using electric power and then starts the combustion engine. The Silent Start enables the vehicle to be started without creating any noise.